I had a really lazy Sunday yesterday, and with the mild, back-to-school weather I started thinking I might actually be ready for fall. I love love love fall but am still clinging to the little shreds of summer that remain. We don't have air conditioning, so for the last few months I haven't made anything that required the oven to be on for more than a few minutes. Now that it's cooled down I was ready for some comfort food and made my mom's mac 'n' cheese. I got a few requests for the recipe after I posted a picture, so here it is. I normally don't post recipes since I'm no Michael Symon, but it's too good not to share. 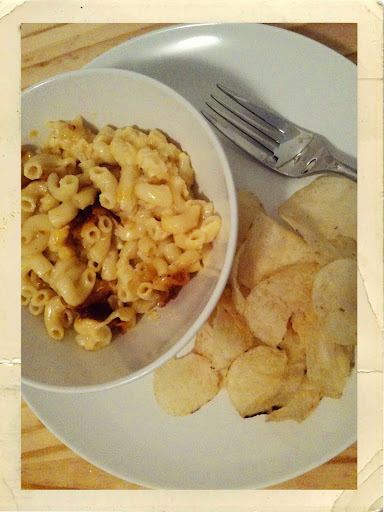 (And yes, thanks to a particular pizza at Danny Boy's, I have discovered that potato chips and mac 'n' cheese is close to heaven). 1 | Preheat oven to 350. 2 | Boil 6 cups water, salted very generously. 3 | Pour macaroni in water and stir constantly for 3 minutes. Then cover, remove from heat and let sit for 10 minutes. 4 | Drain macaroni and rinse in hot water. 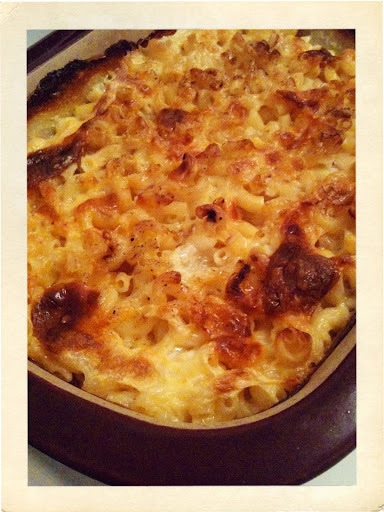 5 | In an oven safe dish, layer macaroni, cheese, and milk in alternating layers. Top with a little salt, pepper, and paprika. 6 | Bake uncovered for 45 minutes to an hour. The mac should be bubbling and browning at the top, and not too milky underneath the top layer. It will thicken up upon cooling, so I usually allow mine to cool for 5 minutes before serving. And that's it! It's my ideal lazy workweek dinner, as long as you can wait an hour to eat. You can see other things I make (food and otherwise) by following me on Instagram, which I am completely addicted to.